This is a example based on the plan from Sensors and blocks. remarks: I tested the plan under WXP. The picture in this document comes from ubuntu. The decoupler get 5s to switch off itself. in the 2.th line is described, that the locomotive will be wait 3 minutes, until to drive from Block 1 to 3.
the condition is necessary for a sound on this place. The schedule start the following schedule. in the 2.th line is described, that the locomotive will not wait 2 minutes, because the time processing is not relative.. The locomotive is to be able to shunt also with electrical railroad cars. The length of the train is variable. -the locomotive drives with the railroad cars to Sensor1 and stopped. -drives a small piece into the other direction, until the Sensor1 is free given. -the locomotive stopped end decouples the waggons. 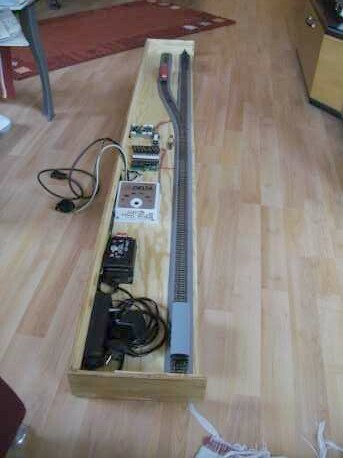 -the Sensor11 is occupied with the electrical railroad car. -Block1 is defined as shunting block, so that a locomotive can drive also into the occupied block. -the action "move_loc" causes a slow trip into against set direction. The Timer is adjusted, so that the next shedule is started later. -the action "stop_loc" is stopped the locomotive.